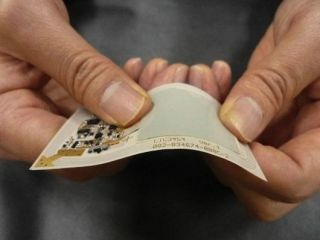 NEC has announced that it is developing a super-thin battery that could be incorporated into credit cards or bendable screens. The organic radical battery (ORB) could be printed into circuit boards just 0.3mm thick and is flexible enough to be used in the bendy screens we're always seeing in concept designs. The new battery tech has already been in development for a number of years, with NEC itself having announced the early stages of its development back in 2005. Aside from being extremely thin, the ORBs are desirable because they eschew the toxic heavy metals found in most batteries in favour of a reaction of salts contained in a polymer gel. At present a version of the prototype battery 3cm square and 0.3mm thick delivers 3mAh, which is enough to update a "small screen display" 2,000 times on a single charge. Its charge cycle life is said to be similar to that of lithium ion batteries that are currently used in most phones and other rechargeable tech. Organic radicals, for the science minded, are molecular entities possessing an unpaired electron. One of the major hurdles facing NEC in bringing the ORB tech to market is converting the radicals into a more stable compound. If NEC does polish off its development, the company's research suggests that ORBs could achieve a higher energy density than conventional rechargeable batteries, meaning thinner tech for you.